The Sunny Boy 6000 (6000US) is part of our larger units in the new "US" series of Sunny Boy string inverters. They are extremely robust inverters equally suited for large residential or commercial applications. Completely updated with our most advanced technology, they were designed specifically to meet the new IEEE 1547 requirements. The larger inverters of the new US series come with an integrated AC and DC disconnect switch making installation even more cost-effective. They can even be configured for positive ground systems in the field making them more versatile than ever. Increased efficiency means better overall performance and shorter payback periods. The Sunny Boy 6000US and 7000US are compatible for use with the Sunny Tower 36 kW and 42 kW systems. Each comes with a standard ten year warranty and are engineered and built to provide years of trouble-free service. 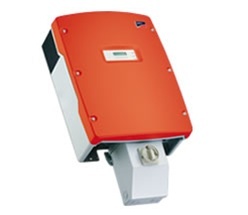 The SMA Sunny Boy inverters are the commonly used grid-tied PV inverter in Europe and the US. SMA inverters available in sizes from 700 watt to 6000 watts enable them to fit a wide range of applications from small residential systems to very large 3-phase industrial systems. All SMA inverters come with LCD digital monitors that display instantaneous power output, energy supplied during the current day and since the installation. The display cannot be used if optional remote communication modules are used in the 1800U and 2500U inverters. The 2500U is available for use on 240 VAC and 208 VAC power. The 6000U can be used on 208, 240 and 277 VAC power. SMA offers a wide range of accessories for communications and monitoring of the system. The 3800U and 6000U is in a NEMA 3R enclosure but all electronics are in in a sealed compartment. All of the smaller inverters are housed in a completely sealed stainless steel enclosure. Outdoor installation is recommended for the sealed inverters so natural air flow can cool the heatsink. The 5000US, 6000US and 7000US can be used in 208, 240 and 277 VAC applications. The 8000US can be used in 240 and 277 VAC applications. These inverters also come with a DC disconnect switch that connects to the bottom of the inverter. The disconnect has a 4-circuit integrated fused series string combiner that can be used with fuses up to 20 amps. The disconnect also has an input main lug for array DC input if the system has a separate combiner box. It is shipped with 15-amp fuses. All four models are field-configurable for positive ground systems. All inverters are compliant with UL 1741, UL 1998, IEEE-929, IEEE-1547, FCC Part 15 A & B. SMA inverters now have a standard 10-year warranty.